We started the Beacon Gospel Choir eight years ago, as we and some others within our community felt the need of an antidote for two mile per hour hymns on Sunday mornings and we were looking to inject a little more life. As I invited people to join us, I quickly discovered that there are an awful lot of people who believe that they can’t sing. The number of people who assure me that they are tone deaf is quite extraordinary. But, actually, everyone who can speak can sing, and I’ve never yet met anyone who was genuinely tone deaf. God loves to hear us singing, the Bible is packed with references that suggest how our relationship with Him is enhanced when we praise Him with singing, He loves a close, intimate relationship with us and He knows that when we sing to Him it lifts our spirits into closer communion. Which can only be good. And I would dare to suggest that if you have grown up believing that you can’t sing, then something precious has been stolen from you by the Devil; something that God intended you to have, something you need. It all starts in junior school. Everyone has heard them, the nativity play is progressing nicely until the first carol is being sung. Little Johnny or little Suzie are singing their hearts out in the back row and they’re kind of standing out. They are, actually, delightful; their enthusiastic tunelessness makes the whole nativity play thing all the more enjoyable. But that doesn’t reduce the pain that the stifled laughter causes them. We love our children for all their foibles, and our conviction that any of them can’t sing is just another of their endearing qualities. We tell them that they have other talents, we give them a hug, we laugh about it with our friends. And little Johnny or Suzie grows up and never forgets. As the years go by it’s reinforced, by siblings, school mates, teachers (I’m sad to say), and anyone else who thinks a jibe is just good natured humour. Actually, when Johnny and Suzie gave their first performance that confirmed for the world their supposed inabilities to sing, all that was going on was that they were growing so fast that their muscular strength and vocal chords couldn’t keep up, in sports we would call the same problem ’baby giraffe syndrome’, it causes weakness and a lack of physical fluency. Given the chance to grow, they learn to run, to jump, to become the athletes they were designed to be, but tell them they can’t do any of those things and they will be scarred for life – never to sing again. Which is a travesty, because a little help would have got them singing beautifully. So, should you be one of those people who has been damaged by the insensitivity of others, let me assure you, you can sing, and this is how to start. You need someone encouraging and musical to sit with you, (no great talent required here, even I can do it) either with a piano, or a tuned keyboard of some sort (if you can’t get hold of a cheap keyboard, then piano / keyboard apps for your tablet, or programs for your laptop are readily available) ; then you need to imagine you are in the doctor’s surgery and he has just asked you to say “aah” so that he can look down your throat. Go on then… say “aah”. Your musical friend can now find roughly what note you are singing and play it back to you. You may need a little help to get the exact note by being coached ’up’ or ’down’, but once you’ve got it, just keep singing it, and really get the feel of being ’in tune’ with the piano. Don’t do any more today, but tomorrow, repeat the exercise; you can be pretty confident that on a new day you will probably start by coming up with a slightly different note, which is just fine. Then, get your friend to coach you up one whole note, back to your start note, and then down one whole note. When your friend tells you that you are in tune, really listen and feel how it is to be in tune with the piano. Keep going up and down with the three notes on the piano. Initially, some people can get stuck, only able to go ’up’ in a short scale, or only able to go ’down’, but don’t worry, just keep starting the process again. Eventually, you will get it. Go away and practice your three notes with a keyboard every day for a week; about ten minutes each time should do it. Gradually, as you continue to practice over a few weeks, you will find that you can extend your range until pretty soon you will find that you’ve got an octave to play with. Remember, you are having to train both your muscles and your ear at the same time, so set yourself achievable targets every day and keep at it. That’s all I’m going to say on the matter now, but I’d love feed back on how you’re getting on. Oh, and incidentally, two important points to remember: firstly, that little voice you hear, that’s telling you that you shouldn’t try because you’ll never be able to sing – one of his names is ’the Deceiver’, and for very good reason. Secondly – IT’S NEVER TOO LATE TO START. 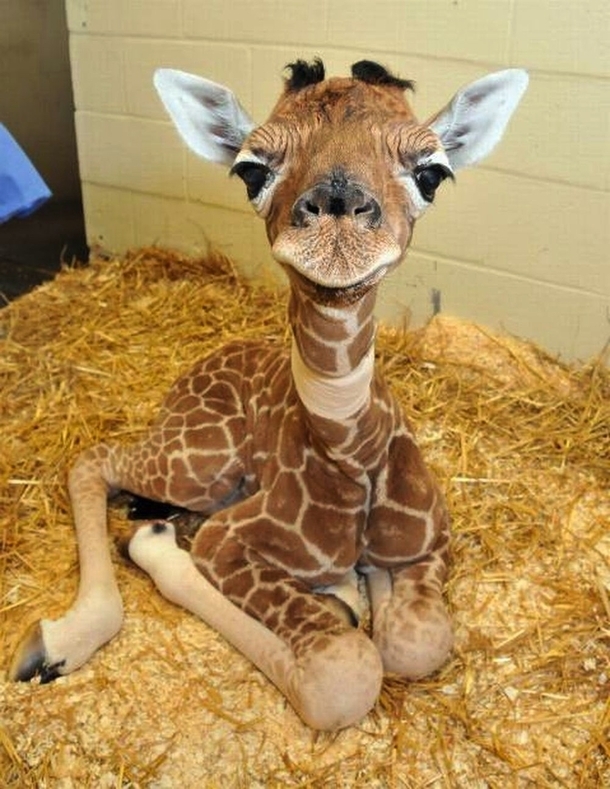 Baby giraffes can sing, but not if you tell them they can’t.